The Eurocopter EC135 (now Airbus Helicopters H135) is a twin-engine civil light utility helicopter produced by Airbus Helicopters (formerly known as Eurocopter). It is capable of flight under instrument flight rules (IFR) and is outfitted with a digital automatic flight control system (AFCS). First flying on 15 February 1994, it entered service in 1996 and 1,300 have been delivered up to January 2018 to 300 operators in 60 countries, accumulating over 4.5 million flight hours. It is mainly used for helicopter emergency medical services then for corporate transport, law enforcement, offshore wind and military flight training. Half of them are in Europe and a quarter in North America, the Eurocopter EC635 is a military variant. The EC135 started development prior to the formation of Eurocopter under Messerschmitt-Bölkow-Blohm (MBB) under the designation Bo 108 in the 1970s. MBB developed it in partnership with Aérospatiale, the Bo 108 was initially intended to be a technology demonstrator, combining attributes of the successful MBB Bo 105 with new advances and an aerodynamically streamlined design. 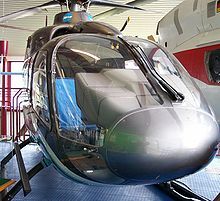 Technologies included on the Bo 108 included the first full-authority digital engine controls (FADEC) on a helicopter, a hingeless main rotor, and the adoption of a new transmission. The first prototype made its first flight on 17 October 1988, powered by two Allison 250-C20R/1 engines. A second Bo 108 followed on 5 June 1991, this time with two Turbomeca TM319-1B Arrius engines; unlike later production aircraft, both technology demonstrators flew with conventional tail rotors. In the late 1990s, the design was revised with the introduction of the Fenestron tail rotor system, an advanced rigid main rotor, composite materials, and resonance isolation systems. It was decided to pursue a full certification program, resulting in the production of two pre-production prototypes; at the same time, it was chosen to give the Bo 108 a new designation of EC135 to correspond with the newly created Eurocopter company. At this point, it was decided that the EC135 should be developed with the option of being powered by two competing engines, the Turbomeca Arrius 2B and the Pratt & Whitney Canada PW206B engines; two pre-production prototypes were built in 1994 powered by either engine, both powerplants proved to be successful and were used on subsequent production aircraft. In January 1995, the EC135 made its first public appearance at the Heli-Expo convention at Las Vegas, at which prospective buyers were reportedly impressed with its appearance and performance figures. Another feature which became apparent upon entering service was the low noise levels produced, in part due to its fenestron tail, the EC135 was the quietest aircraft in its class for more than 15 years. Despite the helicopter's design being primarily oriented towards emergency medical operators, the EC135 had considerable appeal to a wide range of operators. European JAA certification was achieved on 16 June 1996, with FAA approval following on 31 July. On 2 December 1999, the EC135 was granted single-pilot IFR (SPIFR) certification by Germany's Luftfahrt-Bundesamt (LBA). In December 2000, the United Kingdom's Civil Aviation Authority also gave the EC135 SPIFR certification. In 2000, Eurocopter announced the start of certification work on the EC135P2, powered by the Pratt & Whitney Canada PW206B2, offering improved single-engine performance and 30-second emergency power. 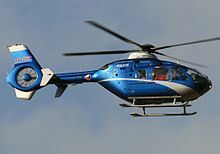 The LBA certification was achieved on 10 July 2001, and the first EC135 with the new engines was handed over to the Swedish Police on 10 August 2001. In September 2002, the EC135T2 equipped with the improved Turbomeca Arrius 2B2 was made available, also providing for improved single-engine performance. In 2002, the EC135 Active Control Technology demonstrator/Flying Helicopter Simulator (ACT/FHS), a research aircraft designed to test fibre optic-based flight control systems, undertook its first flight. In 2014, Airbus Helicopters began flying the Bluecopter Demonstrator aircraft, built to explore more efficient design elements, including economy-optimised single-engine operations, Blue Edge swept rotor blades to reduce noise and increase efficiency, a relocated horizontal stabilizer outside the main rotor's downwash, an active rudder, and new water-based external paint; these changes were aimed at cutting fuel consumption by 40%. In December 2014, it was revealed that the single-engine operations portion of the Bluecopter tests had been delayed to summer 2016 to make necessary avionics changes, such as to the engine's FADEC systems. At the NBAA in March 2007 in Atlanta, Eurocopter unveiled 'L’Hélicoptère par Hermès, a special-edition VIP model designed by Hermès International, S.A.; it features a customized luxury four-place main cabin, a sliding glass partition, a corporate baggage hold, redesigned skid landing gear and other external changes. The launch customer for the type is Falcon Aviation Services (FAS), based in Abu Dhabi, United Arab Emirates. In July 2014, Airbus Helicopters announced that it was making further personalization options available for the EC135 l’Helicoptere par Hermes. In 2011, Eurocopter formalised a license manufacturing agreement with Zhong-Ou International Group to produce the EC135 Luxury Helicopter in Zhejiang Province, China. In October 2015, a letter of intent between Airbus Helicopters and Ecopark was signed for the establishment of a final assembly line (FAL) in Qingdao Province, China; a related $1.1 billion order for 100 Chinese-assembled H135s was announced in the same month. The majority of assembly work on the type remains at Airbus Helicopter's Donauwörth facility. Construction of the FAL started in May 2017 and is expected to be completed by 2018. In January 2016, it was announced that the Ural Works of Civil Aviation (UWCA), a division of Rostec, had signed an agreement to build the H135 under licence at the firm's facility in Yekaterinburg, Russia. In May 2016, it was reported that Russian production of the H135 was anticipated to begin in 2017, following the receipt of Russian type certification; in addition, Russian manufacturers may be incorporated in the global supply chain. Two improved variants, the EC135 T3 and EC135 P3, were developed with improved high altitude and hover performance. Changes include repositioned air intakes to the engines, wider blades being installed on the main rotor, and changes to the fenstron anti-torque tail device. The EC135 T3 was introduced to service in December 2014. The EC135 is a twin-engine rotorcraft. It can be alternatively powered by a pair of Turbomeca Arrius 2B or Pratt & Whitney Canada PW206B engines, dependent on customer's preference (which gives either a P or a T in the variant name). The main rotor is of a four-bladed, hingeless fiber-composite design; progressive improvements to the main rotor have increased its performance and reduced maintenance costs since the type's introduction. The EC135 holds the distinction of being the quietest helicopter in its class, featuring an anti-resonance isolation system to dampen vibration from the main rotor. The type's fenestron anti-torque device can be actively regulated via a HI NR rotor optimization mode, which provides for greater controllability during higher weight take-off and landings. It is capable of performing Category A operations throughout its full flight envelope. The EC135 can be equipped with either a conventional flight deck or the Avionique Novelle glass cockpit – the latter allows for single pilot instrument flight rules operation. The glass cockpit is equipped with several liquid-crystal displays, including two Sextant SMD45 displays and a central panel display. The main avionics suite is supplied by Thales Group; the EC135 can be outfitted with various avionics suites from manufacturers such as Russian firm Transas Aviation and British firm Britannia 2000. The newer H135 model can be equipped with a four-axis autopilot, which is included as part of the Helionix avionics suite; this suite provides the H135 a greater level of commonality with several other Airbus Helicopters-produced rotorcraft including the H145, H160 and H175. Earlier versions of the EC135 were equipped with a three-axis autopilot with integrated stability augmentation; featuring a First Limit Indicator (FLI), simplifying engine and torque monitoring. Cockpit touch screens can be optionally installed. Various cabin and cockpit configurations are available for the EC135, depending on the role performed and the operator's preferences. It can hold up to five passengers and a pilot when configured with a standard executive interior, or seven passengers in a dense corporate interior. Modular multi-role interiors that allow the main cabin area to be quickly changed and re-equipped are also available. The main cabin of the EC135 is accessed either by large doors on either side of the cabin or by clamshell doors located at the rear of the cabin, directly underneath the aircraft's tail boom; the clamshell doors are particularly attractive to emergency medical services (EMS) and cargo operators. Various medical facilities can be installed in the cabin, such as in-flight intensive care stations (including resuscitation functionality), incubators, and hygiene-convenient flooring. In a mountain rescue configuration, the cabin can simultaneously accommodate two stretchers as well as the pilot, anaesthetist, winch operator, mechanic and mountain rescue specialist. Airbus Helicopters has promoted the airframe's various configurations as possessing "unique adaptability" for various missions, including utility work, commercial transportation, and training roles. Equipment for the law enforcement role include external loudspeakers, rappelling system, search lights with laser pointers, left or right-mounted hoists, and electro-optical sensors. For offshore oil & gas operations, the rotorcraft can be fitted with weather/search radars, emergency floatation aids (including an automated external life raft), energy-absorbent seating, class-D certified external hoists, and crash-resistant fuel cells. An external hook can be installed to carry underslung loads of up to 272 kg for cargo missions. In a training capacity, features such a light aircraft recording system (for post-flight analysis), intuitive human-machine interface, specific training modules, and a one-engine inoperative training mode, and full ground simulators, may be selected. Deliveries started on 1 August 1996, when two helicopters (0005 and 0006) were handed over to Deutsche Rettungsflugwacht. 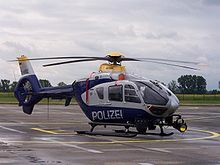 The 100th EC135 was handed over to the Bavarian police force in June 1999; by which point the worldwide fleet had accumulated approximately 30,000 flight hours. In September 2003, the 300th EC135 was handed over to UK-based McAlpine Helicopters; at this point, the EC135 was the best selling new light twin-engine helicopter in the UK market. In 2011, Eurocopter announced that the 1,000th EC135 to be produced had been delivered to German operator ADAC, roughly 15 years following the start of production. In 2012, Flying Magazine recognised the EC135 as being "the industry's best selling twin-engine helicopter". The world fleet leader in flight hours for the type is G-NESV (s/n 0067), operated by Cleveland Police Air Operations Unit based at Durham Tees Valley Airport, UK. Originally delivered to the North East Air Support Unit in April 1999, it was the first EC135 worldwide to attain a total of 10,000 flying hours. In 2009, the EC135 was the first aircraft selected for offshore wind support in the UK after the Civil Aviation Authority approved helicopter operations to the Greater Gabbard offshore wind farm. The EC135 has also been used in Denmark to support the Horns Rev offshore wind farm, by 2013, over 10,000 successful personnel transfers have taken place using the type. In Mexico, Apoyo Logístico Aéreo has operated a fleet of EC135s for servicing the extensive oil and gas offshore platforms in the Gulf of Mexico. In 2013, it was reported that the EC135 was currently providing roughly 25% of the world's total emergency medic services flights, and that over 500 EC135s have been delivered to in an aeromedical configuration. 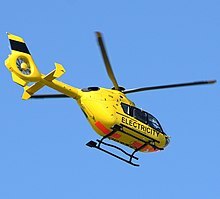 By late 2013, during which a brief grounding of the type was instigated due to safety concerns of fuel gauges, it was noted that the EC135 made up half of the UK's operational air ambulance fleet. In October 2014, the first EC135 air ambulance to be delivered in the Chinese market took place. The German Army operates a total of 14 EC135s as basic trainers at the School of Army Aviation in Bückeburg, these have had an average operational availability in excess of 95 per cent; in 2014, the German Army noted that there was potential for vibration-induced rotor cracking during autorotation training, shortening the life of the main rotor. In October 2014, the Australian Department of Defence announced that the EC135 would be procured as the primary training platform for both the Australian Army and Royal Australian Navy. A total of 13 EC135 trainers have been procured by the Japanese Maritime Self-Defense Force, they have been designed as the TH-135. In December 2014, the first production EC135 T3 formally entered service with Aiut Alpin Dolomites, a mountain rescue operator based in Italy. In June 2015, Airbus Helicopters delivered the first retrofitted H135 from the earlier EC135 standard; changes include an enlarged main rotor, relocated engine air intakes, elevated engine performance, and the horizontal stabiliser's endplates removed and its span increased. In October 2015, Waypoint Leasing and Airbus Helicopters signed an agreement for the acquisition of up to 20 EC135 for public leasing purposes. Powered by two 463 kW (621 shp) Pratt & Whitney Canada PW206B (ratings correspond to Take-Off Power (TOP)). Later versions have the Center Panel Display System (CPDS). Initial maximum take-off weight (M.T.O.W.) of 2,630 kg (5,798 lbs), later raised to 2,720 kg (5,997 lbs) and then 2,835 kg (6,250 lbs). Powered by two 435 kW (583 shp)(TOP rating) Turbomeca Arrius 2B1/2B1A/2B1A1. Later versions have the CPDS. Initial M.T.O.W. of 2,630 kg (5,798 lbs), later raised to 2,720 kg (5,997 lbs) and then 2,835 kg (6,250 lbs). Powered by two 463 kW (621 shp) (TOP rating) Pratt & Whitney Canada PW206B2. Increased thermodynamic and mechanic OEI ratings (128% OEI torque). Replaced EC135 P1 in production in August 2001. Powered by two 452 kW (606 shp) (TOP rating) Turbomeca Arrius 2B2. Increased thermodynamic and mechanic OEI ratings (128% OEI torque). Replaced EC135 T1 in production in August 2002. Latest current production version with 498 kW (667 shp) PW206B2 (new power ratings based on a FADEC software upgrade), plus a 2,910 kg (6,415 lbs) M.T.O.W. upgrade, extended component time between overhaul (TBOs), and a change in the main transmission lubricating oil. Built in Germany and Spain. Latest current production version with 473 kW (634 shp) Arrius 2B2 engines (new power ratings based on a FADEC software upgrade), plus a 2,910 kg (6,415 lbs) M.T.O.W. upgrade, extended component TBOs, and a change in the main transmission lubricating oil. Built in Germany and Spain. Marketing designation of aircraft with increased M.T.O.W. of 2,950 kg (6,504 lbs) within restricted flight envelope. Powered by two 528 kW (708 shp) (TOP rating) PW206B3 engines (new power ratings based on a FADEC software upgrade), plus a 2,980 kg (6,570 lbs) M.T.O.W. upgrade, and significant increased OEI, Cat A, and hot/high performance. Market introduction in 2014. Powered by two 492 kW (660 shp) (TOP rating) Arrius 2B2Plus engines (new power ratings based on a FADEC software upgrade), plus a 2,980 kg (6,570 lbs) M.T.O.W. upgrade, and significant increased OEI, Cat A, and hot/high performance. Market introduction in 2014. Military variant originally developed to meet a Portuguese Army requirement for a fire support and medical evacuation helicopter. Presently, operated by Jordan, Swiss and Iraqi armed forces. Military training variant developed from the EC135 T2+. 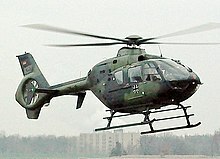 Corporate variant of the H135. In 2016, half of them were engaged in emergency medical services operations, 17% in air transport, 16% in public services (typically law enforcement), 10% in military missions, 4% in offshore operations (typically offshore wind power inspection), and the remaining 3% in military training. The 1300th was delivered in January 2018, as over 300 customers in 60 countries accumulated more than 4.5 million flight hours. Most are in Europe (641), followed by North America (316) and Asia (195). Brazilian Navy - 3 EC135 T3 ordered to replace AS355F2. Eurocopter EC135P2+ of the National Police Corps of Spain. ^ a b "Helicopters Airbus Helicopters delivers 1300th helicopter from the H135 family" (Press release). Airbus. 29 January 2018. ^ a b c d e f g h i j k l m Pope, Stephen. "Eurocopter EC 135." Flying Magazine, 18 May 2012. ^ a b c d e Benenson, Tom. "The EC135: Melding form & Function." Flying Magazine, April 2004. Vol. 131, No. 4. pp. 86–91. ^ Rimmer, David. "EC 135 Gains Single-Pilot Certification." Business & Commercial Aviation, January 2001, Vol. 88 Issue 1. p. 17. ^ a b c Benenson 2004. p. 89. ^ "Fly-by-light EC135 helicopter makes first flight." Flight International, 5 February 2002. ^ Dubois, Thierry. "Airbus Helicopters Unveils Bluecopter Demonstrator." AIN Online, 7 July 2015. ^ Perry, Dominic. "Bluecopter flights end without tests of single-engine operation." Flight International, 2 December 2015. ^ "Eurocopter and Hermès deliver first EC135 'l'Hélicoptère par Hermès'." Business Jet Interiors International, Retrieved: 31 May 2015. ^ Wynbrandt, James. "Web Extra: More Personalization Options for Hermes EC135." AIN Online, 16 July 2014. ^ "EC135 Helicopter to be built in China". Archived from the original on 19 July 2011. Retrieved 18 July 2011. ^ "Airbus Helicopter Signs China Deal for More Than $1b." Bloomberg, 30 October 2015. ^ Perry, Dominic. "H135 helicopters due for China assembly." Flight International, 30 October 2015. ^ "Airbus Helicopters breaks ground on first helicopter assembly line in China" (Press release). Airbus Helicopters. 27 May 2017. ^ Gerden, Eugene. "Russia's Ural Works of Civil Aviation to start licensed production of H135s." Vertical, 28 January 2016. ^ Korsunskaya, Darya. "Russia signs license agreement on producing Airbus H135 helicopters in Russia." Reuters, 25 January 2016. ^ "Airbus Helicopters plans to start producing H135 helicopters in Russia in 2017." TASS, 13 May 2016. ^ a b c Nathan, Stuart. "Helicopters give latest technologies a whirl." The Engineer, 12 December 2014. ^ a b c d e f g "Civil: H135." Airbus Helicopters, Retrieved: 16 November 2015. ^ a b c Benenson 2004. pp. 89–90. ^ "Eurocopter shows the capability of its helicopters at MAKS 2011." Archived 24 September 2015 at the Wayback Machine Force, September 2012. ^ "CAMC selected as NPAS EC135 mission system." Shepard Media, 17 November 2014. ^ Perry, Dominic. "H135 gains Helionix avionics suite." Flight International, 7 October 2015. ^ Benenson 2004. pp. 89, 91. ^ Derby, Paul. "Landmark delivery for Eurocopter EC135." Flight International, 17 June 1999. ^ Benenson 2004. p. 90. ^ "Eurocopter delivers 1000th EC135." shephardmedia.com, 21 July 2011. 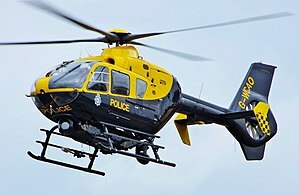 ^ "NPAS Newcastle." Twitter, 31 March 2013. ^ "Helicopter Focus: EC135 chosen for offshore wind farm maintenance role". ^ "Page not found – UK Civil Aviation Authority" (PDF). ^ "Uni-Fly A/S Rescue from Windturbine". YouTube. 30 August 2007. Retrieved 16 February 2015. ^ "Uni-Fly A/S". Uni-fly.dk. Retrieved 5 May 2013. ^ "Eurocopter reinforces its Gulf of Mexico presence: Apoyo Logístico Aéreo orders another EC135 helicopter for off-shore oil and gas missions." Airbus Helicopters, 6 March 2013. ^ Ozbek, Tolga. "EC135 picked for Turkish air ambulance duties." Flight International, 9 May 2013. ^ Roberts, Liz. "Fuel-gauge worry grounds almost half Britain's air ambulances." Grough, 12 December 2013. ^ "Airbus Helicopters delivers China's first EC135 fully-equipped air ambulance." Aviation World News, 9 October 2014. ^ Tomkins, Richard. "Airbus Helicopters continues support for German Army pilot training." United Press International, 17 December 2014. ^ "Auto-rotation training drives German army light-twin requirement." Flight International, 25 June 2014. ^ McLaughlin, Andrew. "Australia confirms HATS win for Boeing/Thales EC135 bid." Flight International, 25 October 2014. ^ a b "Japan military receives TH-135 trio from Airbus Helicopters." Vertical, 5 December 2014. ^ "Turbomeca Celebrates Arrius 2B2plus Entry-into-Service on EC135 T3." Newswire today, 10 December 2014. ^ Spruce, Terry. "Airbus Helicopters delivers first upgraded H135." Helicopter Investor, 18 June 2015. ^ "Airbus Helicopters Upgrades Bavarian Police H135s." Aviation Today, 17 June 2015. ^ "Waypoint Leasing to acquire 20 H135s as first lessor for this rotorcraft." Vertical, 7 October 2015. ^ "Type Acceptance Report" (PDF). Retrieved 5 May 2013. ^ a b Dubois, Thierry. "Deliveries of Airbus Helicopters EC135 T3/P3 Delayed." AIN Online, 25 February 2014. ^ Dominic Perry (29 November 2016). "ANALYSIS: How Airbus Helicopters has kept its 20-year-old H135 looking young". FlightGlobal. ^ "WorldAirForces2016-Corrected.pdf". flightglobal.com. Retrieved 10 December 2015. ^ Barreira, Victor (24 December 2018). "Brazilian Navy to acquire EC135 T3 helicopters". Jane's 360. Rio de Janeiro. Archived from the original on 3 January 2019. Retrieved 3 January 2019. ^ a b c d "World Air Forces 2013" (PDF). Flightglobal Insight. 2013. Retrieved 17 March 2013. ^ "Gabon's new Helicopter!". smallairforces.com. Retrieved 17 March 2013. ^ "The Moroccan Royal Gendarmerie is recognized for its 50 years of Eurocopter helicopter operations". eurocopter.com. Archived from the original on 9 April 2013. Retrieved 17 March 2013. ^ "Moroccan Royal Gendarmerie EC-135T". Demand media. Retrieved 17 March 2013. ^ AirForces Monthly. Stamford, Lincolnshire, England: Key Publishing Ltd. August 2016. p. 30. ^ "Materiales – Helicópteros – HE-26". Ministerio de Defensa de España. Retrieved 26 March 2013. ^ "Eurocopter delivers second EC135T2+ to Argentina's Federal Police". ^ "Eurocopter EC135 in Gendarmeria Nacional Argentina". ^ "Austrian Minister of the Interior presents Eurocopter EC135 to Air Police in Innsbruck". ^ "Eurocopter Canada delivers two EC135P2+ to Ontario Provincial Police". helihub.com. Retrieved 17 March 2013. ^ "MUP RH kupio helikopter EC-135 za nadzor granice i prijevoz stradalih". defender.hr. Archived from the original on 30 June 2013. Retrieved 27 June 2013. ^ "Eurocopter EC 135". vrtulník.cz. 29 July 2011. Retrieved 25 December 2013. ^ "Turbomeca sign support agreement with German Federal Police". helihub.com. Retrieved 17 March 2013. ^ "Allgemeines". polizei.rlp.de. Archived from the original on 27 May 2014. Retrieved 26 May 2014. ^ "Légimentés: milliárdokért cseréltek gazdát a helikopterek". napi.hu. Retrieved 11 September 2018. ^ "Garda Air Support Unit (GASU)". 2014. An Garda Síochána. Retrieved 6 May 2014. ^ "Eurocopter Japan delivers EC135T2 to National Police Agency". helihub.com. Retrieved 17 March 2013. ^ "Valstybės sienos apsaugos tarnyba". Pasienis.lt. 30 April 2013. Retrieved 5 May 2013. ^ "Hoe ziet de luchtvloot er uit?". politie.nl. Retrieved 3 August 2013. ^ "Norwegian Police lease second EC135". helihub.com. Retrieved 17 March 2013. ^ "EC 135". lpr.com.pl. Archived from the original on 15 December 2013. Retrieved 12 December 2013. ^ "EC 135". www.aviatie.mai.gov.ro. Retrieved 17 February 2014. ^ "EC 135". smurd.ro. Retrieved 17 February 2014. ^ "Heli-One upgrades EC135 for Slovenian National Police". helihub.com. Retrieved 17 March 2013. ^ Dirección General de la Policía. "Servicio de Medios Aéreos-Helicópteros". Retrieved 20 March 2013. ^ Guardia Civil. "El Aire". Archived from the original on 12 July 2013. Retrieved 20 March 2013. ^ "Northern Lighthouse Board upgrading to EC135". helihub.com. Retrieved 12 December 2013. ^ "National Police Air Service (NPAS)". .durham.police.uk. Retrieved 30 September 2014. ^ "Glasgow City Heliport Based Aircraft". ukemergencyaviation.co.uk. Retrieved 30 November 2013. ^ "Broward County Sheriff orders third EC135". helihub.com. Retrieved 17 March 2013. ^ "State Police Airwing Section". mass.gov. Retrieved 4 July 2014. ^ "Glasgow helicopter crash: Nine dead at Clutha pub". BBC News. 30 November 2013. ^ "Glasgow helicopter crash: ninth body recovered". BBC News. 2 December 2013. Wikimedia Commons has media related to Airbus Helicopters H135. "Eurocopter EC135". RTH.info (in German). "Type Certificate Data Sheet" (PDF). European Aviation Safety Agency. 27 October 2011. Peter Gray (25 November 2016). "FLIGHT TEST: We run the rule over Airbus Helicopters' H135". Flight International. This page was last edited on 17 March 2019, at 22:48 (UTC).